EDITOR'S NOTE: Claudia Teachman is October's featured artist at the Blue Moose Craft & Gift Gallery, 29 High St., Brattleboro. The Moose's eclectic offerings include utilitarian and decorative work by local, national, and international artists, artisans, and design studios. 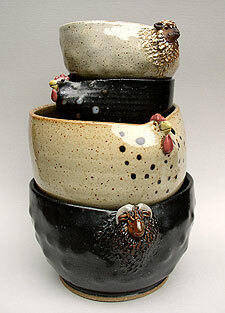 Claudia Teachman began making small animals from potter's clay in 1996 as a creative relief from the rest of her life. She kept some, gave some as gifts, and then realized she could market more widely the work that she finds so stimulating, interesting, and enjoyable. Her more recent output combines a love of sculpting with a desire to make utilitarian and fun pieces of art for everyday use: "As a tactile person I am very drawn to the way of clay." At first glance, Claudia's clay animals often seem simply whimsical; on closer inspection, however, one can see the care and intention with which they are shaped. "Sometimes it seems as if the clay has a mind of its own and I am just the willing hands." All of Claudia's pieces are individually handcrafted. She adds mason's stains, ilmenite, and other colorants to achieve different hues, and uses a variety of clay bodies in pursuit of gradations of color and texture. "My claywork is an expression of 'joie de vivre' and connection with the natural world. It is meant to touch a place deep within. It comes from the bottom of my heart as an offering."